Hi there — I’m Luna! 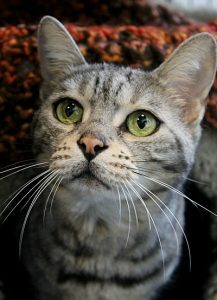 I am a strikingly gorgeous American Shorthair mix with spots like a leopard and stripes like a tiger! I’m about 5 years old and am a very lively young lady with a lot of energy and personality to go around. I have a really silly sounding meow which you’ll hear if you walk up to my cage — I’m saying, “Hello! Please pet me!” I’m extremely affectionate and really crave human attention. Just look at me, I’m cute as a button! 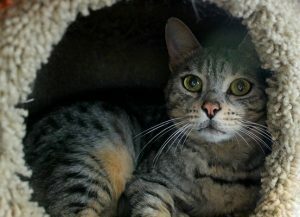 I have lived peacefully around other cats in the past but after going through transition and being at the shelter, I’m not a huge fan and would probably need slow introductions to any new potential kitty family members. I’m currently living at the Petco on SE 122nd & Division, so come say hello and fill out an application if you’re interested in taking me home! I just know we’d be best friends. I come to you spayed, vaccinated, and micro-chipped for an adoption fee of $100.